This post is the subject of our second episode with Zero Point Fiction podcast (learn more about our collaboration here). Check out the episode on iTunes and Spotify, or stream it here. Imagine you were tasked with opening a movie by shooting a scene of a duel. One of the participants is the main character’s father, and this duel will set the tone for the story, with subtle foreshadowing. How would you approach it? Many may consider ways to build tension and suspense—a use of close-ups and exchanging glances perhaps. Few might position the camera far from the action, setting a wide focal length with the characters in the distant background and the foreground as a stone wall in 18th century Ireland. 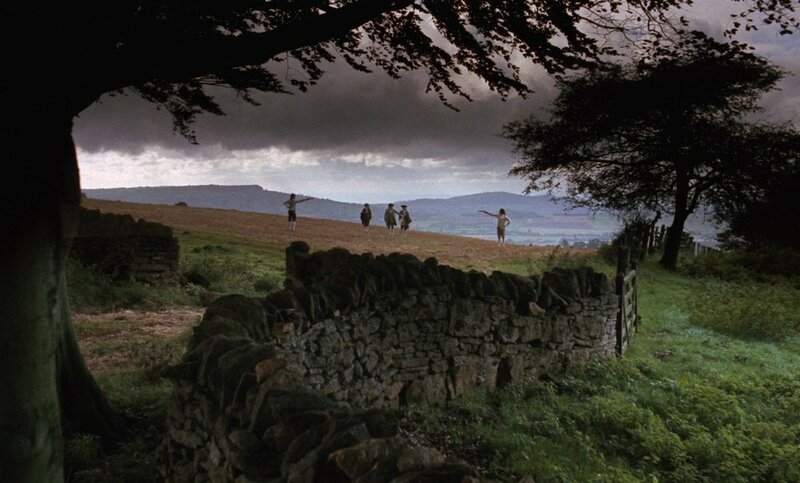 This latter set-up is exactly how Kubrick opened his 1975 film, ‘Barry Lyndon.’ The duel looks a moving European painting—arms raised, a shot fired, a body dropped—the composition of the image holds throughout, remaining immaculate. Stanley Kubrick on set, ‘Barry Lyndon.’ Image via Port Magazine. Kubrick’s ‘Barry Lyndon’ is the result of an intrepid, uncompromising, artistic vision, and worthy of study for those looking to express their artistic voice. Adapted from a novel by William Thackeray, ‘Barry Lyndon’ takes place in the late 18th century, where an Irishman, Redmond Barry, journeys from courting his cousin in the fields of Ireland and manors of Ireland to fighting for Britain in the Seven Years’ War to eventually marrying a countess. There is much in between, and the movie runs over 3 hours. Initially, I thought the length and the film’s reputation for its slow pace would make it a difficult watch. Surprisingly, I found it quite entertaining. I was totally immersed in the world. This immersion was no doubt due to the work ethic and strong vision of Stanley Kubrick and his team. Pre-production lasted for longer than a year (with the production taking place in 1972 and 1973). Image via Plot & Theme. The commitment to the artistic intent in this film is beyond the realm of the rational. The production tried to stay true to the spirit of the time, covering everything from costumes to the source of light. Stanley Kubrick on set, ‘Barry Lyndon.’ Image via Scraps from the loft. The results, speak for themselves. With Kubrickian symmetry and slow zoom outs, every shot in this film not only has beautiful composition and intricate detail, but they all serve the story. French film critic (and Kubrick expert) Michel Ciment remarked that he would not cut a frame from ‘Barry Lyndon’—I could not agree more. This film is a body of work that composes a complete whole. At release, ‘Barry Lyndon’ did not make much money. And while it was generally well received, it did not garner the universal acclaim it now enjoys. By some accounts, Kubrick was saddened by the reception at the time, and that may have influenced his decision to shoot the safer (albeit still great) The Shining. But today, more than 40 years later, ‘Barry Lyndon’ not only stands as an achievement of filmmaking, but as a par excellence example of fully committing to and executing on an artistic vision. By acting with immense respect for the craft, Kubrick was able to confidently tackle the challenges of production to create this master work. Along the way, Stanley Kubrick innovated and pushed the filmmaking medium forward—almost as a by-product of his main efforts to make ‘Barry Lyndon’ live up to his imagination. ‘Barry Lyndon’ feature at Cinephilia & Beyond, includes the script and rare photos. ‘Barry Lyndon’ Criterion Collection release. The special features have informed much of this post.